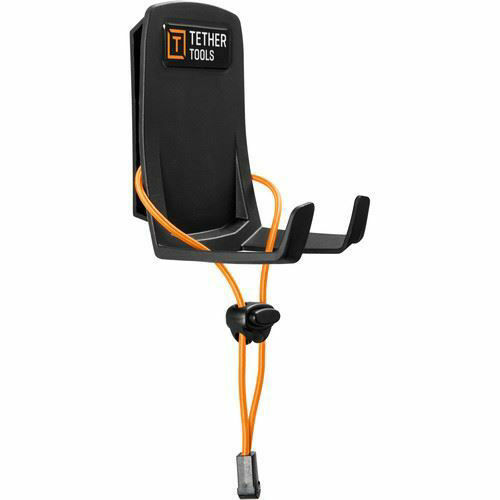 Mount your on-camera flash to nearly any flat surface with the RapidMount SLX Speedlight Holder from Tether Tools. Designed to cradle your speedlight and able to hold up to 1.5 lb of gear, this RapidMount SLX will easily hold most flash units and radio triggers since the design allows the hot shoe to remain free. Ensuring secure placement, the mount is equipped with a drawstring that will tighten around the flash to keep it in place. To attach the RapidMount to a wall or window, use of one of the ten included RapidStrips. These 1/16", white, polyethylene, double-coated, foam pads use a synthetic rubber adhesive that will not leave any residue when removed. It's strong and can mount to flat smooth or lightly textured surfaces such as drywall, mirror, laminate, fiberglass, metal, tile, and more, but it will not work with raw wood, brick, soft plastics, fabrics, or wallpaper. Box Dimensions (LxWxH) 7.7 x 7.1 x 3.7"